Annie Levitz got carpal tunnel from texting. On their own, short text messages like those may seem harmless enough, but send 100 a day and you could land yourself at the doctor's office, facing the prospect of surgery. 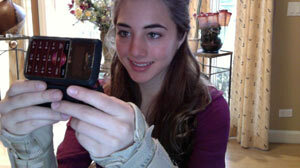 Just ask Annie Levitz, a Chicago-area 16-year-old who's been diagnosed with carpal tunnel syndrome. The reason? Too much texting. Levitz said it started with shooting pains and tingly, numb sensations in her hands. When the condition started to interfere with her ability to grasp everyday objects, she and her family realized it was time to figure out what was going on. "Enough dishes were broken that my parents and I really started to notice and decided to see a doctor," said Levitz, who lives in Mundelein, Ill.
She said her parents took her to see Dr. Sofia Aksentijevich, a local rheumatologist, in September. When the doctor diagnosed her with carpal tunnel syndrome, Levitz said she couldn't believe it. "It just seemed ridiculous to me," she said. "But it's true." Levita, a high school junior, said she sent about 100 text messages a day at her peak, which, according to a recent Nielsen study, is about average for an American teenager. In January, the media research firm reported that the average teenager sends 3,146 messages each month, or 10 messages every hour not spent in school or sleeping. But living with the consequences of so much texting has forced her to scale back to 20 to 30 messages per day, Levitz said. Per doctor's orders she wears a brace on each hand at night (and sometimes during the day) and expects to undergo surgery as soon as she can fit it into her schedule. "I definitely regret it," she said about her heavy texting. "It's painful, first of all. It's embarrassing wearing the braces, and having people know – it's not the greatest." Her friends and classmates also couldn't believe that texting could lead to such a serious medical condition, she said. Some students in her science class called her "carpal tunnel girl," she said, but added, "it was all in good fun." Dr. Aksentijevich said carpal tunnel syndrome results when the median nerve, which extends from the forearm to the hand, becomes compressed at the wrist. When you text, type or make other repetitive motions, irritated tendons or other swelling can squeeze the nerves inside the narrow "carpal tunnel." Patients first feel "tingling, decreased sensation and eventually decreased strength," she said. "Over time, you can have weakness, a hard time writing or start dropping things." She said the condition is pretty common among the general population, but unusual among people less than 20 years old. Dr. Aksentijevich said Annie was probably the youngest patient she'd diagnosed with carpal tunnel. Carrie Levitz, Annie's mother, said that as her daughter began to complain about the symptoms, she worried that she had a neurological problem. When she heard the doctor's diagnosis, she said her first reaction was anger. "I told her she had to slow it down," she said. Over the past few months, she said, Annie's cut down her texting from as much as 4,000 messages a month to about 2,000 each month. "We're constantly working on trying to bring that down," she said. For her part, Annie thinks a touchscreen iPhone might be one viable solution. "I do think that since it's touch it won't be as rough on my hands," she said. But until she can convince her parents, she said she's more willing to follow their advice. "Just know that it can happen to you, and listen to your parents when they're talking," she said. "They know what they're talking about."